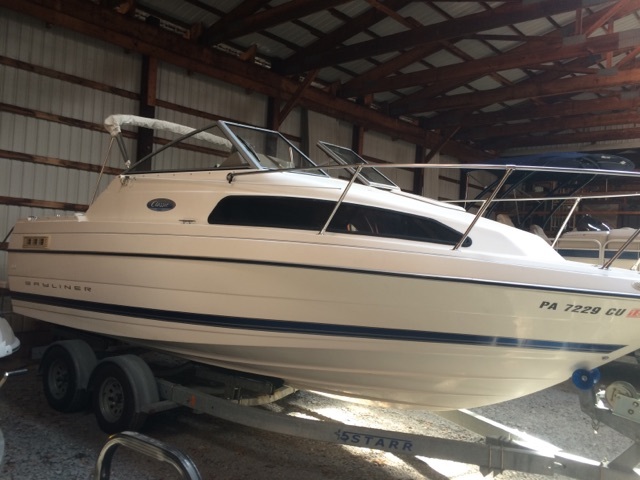 2005 Bayliner 222 Classic, THIS IS A REAL GREAT PIECE FOR SOMEONE LOOKING FOR A LOT OF BOAT WITHOUT PAYING FOR SOMETHING BRAND NEW. ONE IMPERFECTION ON A REMOVABLE CUSHION ON THE AFT BUT VERY WELL MAINTAINED. INCLUDES BIMINI TOP AND COCKPIT COVER. 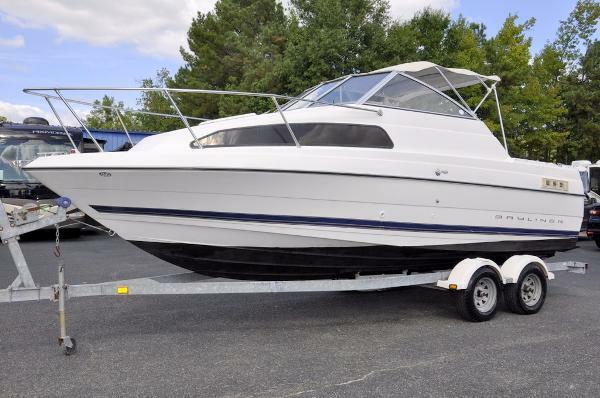 2005 Bayliner 222 Classic 2005 Bayliner 222 EC Classic Cruiser, She Is Powered With A 5.0L 220 HP Mercruiser And Alpha 1 Outdrive, Swiveling Captains Chair, Back To Back Passenger Seats That Easily Convert To A Long Lounger, Large Storage Compartment Beneath, Full Width Rear Bench Seat W/ Removable Bottom Cushions For Easy Floor Access, Transom Storage, Stand Up Bimini Top, Large V-Berth That Easily Converts To Daytime Seating W/ Pedestal Table Or Nighttime Sleeping, Private Head W/ Porta Potti, Boarding Platform W/ Ladder, Trim Tabs, Bow Anchor Locker, Trailer Is Included In The Sale, Don’t Miss This Opportunity To Get A Well Powered Vessel At An Affordable Price, Inquire Today!! 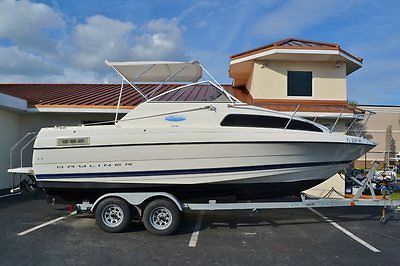 Marine Connection Boat Sales 1-772-222-7850 Vero Beach, FL 2005 Bayliner 222 Classic Cruiser Cruiser (Power) 2005 Bayliner 222 Classic Cruiser Boat 5.0L Mercruiser Powered $16,900 ConditionUsed MakeBayliner Model222 Classic Cruiser Powered byMercury MerCruiser 5.0L Length22'3" Beam8'1" Hours (Actual) Get Pre-Approved PHOTOS BOAT HIGHLIGHTS Bimini Top Boarding Ladder Compass Fresh Water Sink BOAT INFORMATION The 222 Classic is Bayliner's entry-level cruiser intended to offer that first experience into overnighting and family boating fun. As such, she does a good job of providing the basic necessities to get you and your family on the water. The 222 Classic measures 22'3'' long by 8'1'' wide and draws a maximum draft of 2'10'' making it a very easy boat to handle and gives you the ability to maneuver in close quarters without breaking a sweat.The layout is simple and the basic philosophy behind this model is that you get a very easy to maintain boat that will serve you and your family for the initial step into the boating world and beyond This 2005 Bayliner 222 Classic Cruiser is in good shape. It is powered by a 5.0L V8 Mercruiser engine with alpha one outdrive. Down in the cabin she has a removable table and a cushioned berth. There also is a fresh water sink and a head. The cockpit is spacious and has a fishwell and in floor storage. There is a bimini top to keep you out of the sun. It has plenty of power to pull a ski or tube. 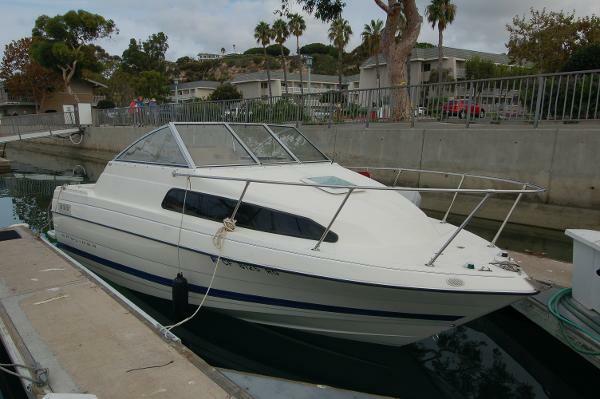 If you are looking for a boat to cruise the water in and have a cabin this Bayliner would be great. It comes with the tandem axle trailer shown in the pictures as well. Our Service Department has performed a mechanical evaluation & water tested it and she performs great. Surveys and mechanical inspections are welcome. Sold as-is, where-is. HISTORY REPORT Know before you buy with a Boat History Report. These comprehensive reports include: Accident check, Salvage check, Environmental Lien check, Seizure check, Hurricane Damage checkand much more... Click below for your FREE Boat History Report! That's right, we have already paid for it! View Boat History Report FEATURES & OPTIONS SPECIFICATIONS HIN USDA22CPI405 Length 22'3" Beam 8'1" Person Capacity 9 Weight 4,078 lbs. 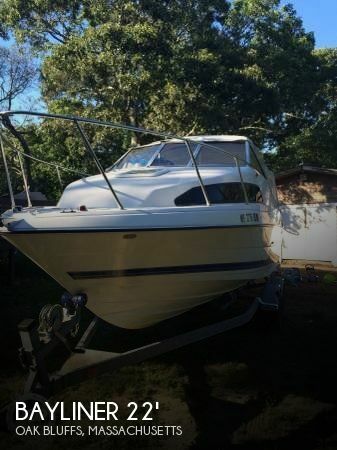 Deadrise 21 Draft 1 Fuel Capacity 55 gal Exterior Top Bimini-Top Exterior Color White Engine(s) Mercury MerCruiser 5.0L, 0W049079 Drive Model Alpha 1 TRAILER A 2005 Magic tilt Tandem Axle Galvanized trailer IS INCLUDED in the price of the boat! FINANCING SHIPPING & DELIVERY United StatesWe offer nationwide delivery to your door! Please contact our Sales Department for an accurate delivery quote. International / Export Australia: We ship to Sydney, Brisbane, Melbourne, Fremantle and all Australian ports. Please our Sales Department for the most accurate shipping rates. Canada: We can deliver to your nearest boarding crossing. Please contact our Sales Department for pricing. Europe: We ship to Bremerhaven, Amsterdam, Gotherburg, Southampton and all European ports. Please contact us for the most accurate shipping rates. We also offer CE Certification! South & Central America: We ship to all major ports, please contact our Sales Department for the most accurate shipping rates. Asia: We ship to all major ports, please contact our Sales Department for the most accurate shipping rates. ABOUT MARINE CONNECTION The Ultimate Boat Shopping Experience. Welcome to Marine Connection - South Florida's #1 Boat Dealer. We are a new boat dealer for Cobia, Hurricane, Pathfinder, Sportsman, Rinker, Bulls Bay and Sweetwater boats along with pre-owned bank repossessions, liquidations, factory distressed short sales, close-outs, trade-ins, and more. We have been selling and exporting boats since 1987 and still hold true to our founding goal of providing the most pleasant and professional boat purchasing experience for thousands of satisfied customers. Marine Connection has been named Boat Dealer of the Year by Boat & Motor Magazine and ranked 6th in Boating Industry Magazine's list of Top 100 Boat Dealers, the most coveted award in marine market. We were also one of the first dealerships in the nation to receive Five Star Marine Industry Dealer Certification. Our NEW Vero Beach store is conveniently located on US Highway 1, just south of 17th Street. This facility is the exclusive new boat dealer for Cobia, Hurricane, Pathfinder, Sportsman, Bulls Bay and Rinker boats on the Treasure Coast! View our other Auctions CONTACT US Located at Marine Connection - Vero Beach 1530 U.S. 1 Vero Beach, FL 32960 Business Hours Monday Closed Tuesday 9:00am - 6:00pm Wednesday 9:00am - 6:00pm Thursday 9:00am - 6:00pm Friday 9:00am - 6:00pm Saturday 9:00am - 6:00pm Sunday 10:00am - 4:00pm Deposit is required within 2 days from end of auction (non refundable) and full payment is required within 7 days. We offer a number of financing options with approved credit. If you are planning to use our financing services, please pre qualify before bidding by calling us at 1-888-693-3470. Boat must be paid in full before delivery. All boats are charged a $240.00 administrative office paperwork fee, for Florida residents we also collect sales tax. Items are listed internationally and we reserve the right to end listings early. Payment methods: Certified Cashier's Check, Wire Transfer, Cash in Person - call for more details. Shipping: Nationwide delivery is available as well as shipping worldwide.